Data from 386 patients, fairly representative of myasthenic population seeking medical advice, were analyzed for clinical spectrum, course and long-term outcome. There were 237 males and 149 females (3:2) with a mean age at onset of 30.6 years. Family history of myasthenia was noted in 5.4% patients. During the first month after the onset symptoms and signs were confined to ocular muscles in 47%, bulbar muscles in 12.5% and involved extremities in 9.4% of patients while 30% individuals had generalized MG. Fifteen patients had chronic limb girdle myasthenia. Of the 181 patients with ocular myasthenia at onset, 53% patients subsequently developed generalized disease and in 44% of these patients it occurred after two years of the onset. Thymectomy was performed in 16% of patients and 70% of the patients were treated with one or more immunosuppressive drugs at sometime. At last follow-up (mean -5.1 yrs), 41 % patients were asymptomatic, 40% reported improvement and 19% deteriorated. Drug free stable remission was achieved in 11% of patients. There was a trend for better outcome in patients undergoing thymectomy than medically treated patients, however the drug free remission rate was same in both the groups. MG was lethal in 11% of patients, principally in women, older than 35 years, and in patients in grade 3 or worse at first observation. Forty-three episodes of myasthenic crisis in 34 patients were analyzed. Infection was the commonest precipitating event. Median interval between the onset of symptoms to crisis was 13 months. Nine episodes of crisis were fatal, with a mortality rate of 21%. A significant reduction in crisis mortality from 40% during 1980-1990 to 10.2% during 1991 to 1999 was noted, reflecting improvement in management strategies. Average age of our population is steadily increasing. This demographic change poses major challenges in the medical care of the population; especially seizure disorders in the elderly. Seizures are frequently encountered in the elderly due to many medical/surgical diseases common in that age-group as well as the treatment of these conditions. Incidence and prevalence of seizures increases with increasing age. Stroke, brain tumors, head injury and various metabolic disorders which are frequent in the elderly enhances the occurrence of seizures in them. About 35% of all seizures in persons above 75 years of age present with status epilepticus often with increased mortality. Frequency of seizures in the acute stroke may be 12-15%, while the risk of epilepsy may be as high as 30%. Age and risk factors of stroke are also risk factors for epilepsy in the elderly. Differentiation of large number of non epileptic conditions from seizure and epilepsy is a difficult task. Though we have listed some of the conditions, the list is not all inclusive. Electroencephalography (EEG) is less sensitive and specific than imaging studies. Cerebral atrophy and white matter changes are common in elderly; the pathological significance in seizures is not understood. Positron emission tomography (PET) and Single photon emission computed tomography (SPECT) give functional information in addition. The information given below will help us understanding the problem of seizure in the elderly. Cerebral tumors are not characterized by any specific findings in electroencephalography (EEG) and are conveniently diagnosed with various brain imaging techniques. However, the diagnosis might get delayed in patients presenting with seizures without associated headache or focal neurological deficits. 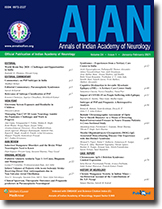 The current report describes a child who presented with recurrent generalized tonic-clonic seizures without any associated clinical symptoms of one-year duration and had no focal deficits on neurological examination. Awake EEG showed a 66% depression in amplitude over the left parietal, posterior temporal and occipital regions, which persisted during sleep. This made us suspect the presence of an underlying structural lesion, which was confirmed by an MRI scan of the brain. The significance of amplitude asymmetry in EEG is discussed and relevant literature reviewed. The clinical features of lateral medullary syndrome include ipsilateral decreased pain and temperature sensation over face, Horner's syndrome, gait ataxia, vertigo with nausea and vomiting and reduction of pain and temperature of contra lateral half of body (6). At times, there is also an ipsilateral facial weakness due to ischemia of the caudal part of the 7the nerve nucleus just rostral to the nucleus ambiguus (11). Rarely an ipsilateral upper motor neuron (UMN) facial weakness may be present and the same may be explained by the interruption of the hypothetical looping supranuclear corticofacial fibres which are said to ascend up in the dorsolateral medulla to reach the 7th nerve nucleus from below (8, 9, 10). A single case report is presented here in support of the above neuroanatomical postulate. The syndrome of multiple enchondromas is known as Ollier's disease. Enchondromas are benign tumours of hyaline cartilage arising within the medullary cavity of tubular bones. We are reporting the case of a 16 year old girl with Ollier's disease who presented with seizures and brainstem compression. A MRI scan of brain showed an intracranial space-occupying lesion in the region of clivus. The intracranial tumour was surgically removed and the histopathology confirmed the diagnosis of enchondroma. Intracranial enchondroma is an extremely rare situation and reported for the first time from south India. Hyperhydrosis of axillae, palm and sole is not a very uncommon problem. It leads to great embarrassment and considerable emotional stress to the individuals. Botulinum toxins prevent the release of acetylcholine at nerve terminals, therefore, reduces sweat secretion. Six patients of axillary and 4 patients of palmer and planter hyperhydrosis were treated with botulinum toxin. All patients experienced relatively satisfactory reduction of hyperhydrosis for period ranging between 4-7 months. No adverse effects were observed. Botulinum toxin therefore can be considered as an effective treatment in focal hyperhydrosis. Background: Gilles de la Tourette's Syndrome (GTS) is a neuropsychiatric disorder characterized by motor and vocal tics associated with obsessive compulsive disorder (OCD) and attention deficit hyperactivity disorder (ADHD). This syndrome is often misdiagnosed as psychiatric disorder, therefore neuropsychiatric evaluation in patients suffering from it is very essential to make the correct diagnosis. Few reports, mostly single case reports of GTS from India have been published, this series attempts to define the clinical spectrum of patients from India. Aim : To study the clinical profile of patients with GTS in India. Setting and Design : Prospective hospital based study. Material and Methods : Ct scan of the head and EEG were done in all the 14 cases in addition to clinical history and detailed neurological examination. The diagnosis of GTS was made according to Tourette Syndrome Classification Study Criteria Group. Findings were statistically analyzed. Results : In all a total of 101 simple motor tics and 21 complex motor tics were observed in 14 cases. Most common site of simple motor tics was the facio-nuchal region (70%) and type was eyebrow raising seen in 10 cases (71%). Commonest type of complex motor tics nose blowing (35%). Vocal tics were found in all 14 cases, simple (56%), being more common than complex vocal tics i.e, coprolalia (42%). Throat clearing was found in (50%) cases and was the most positive in 28%. OCD was seen in 64% and ADHD in 28%. All the 14 cases Responded well to treatment. Conclusion : The clinical profile of patients in our case series is similar to those reported from the western countries with the exception of coprolalia, and ADHD, the incidence of which is higher in this case series. We Report a case of "Dropped head syndrome" [DHS] due to Amyotrophic lateral sclerosis [ALS]. A thirty seven year old gentleman was admitted with progressive limb and bulbar weakness of 10 months duration. He developed drooping of the head six months after the onset of illness. After clinical examination and investigation a diagnosis of Amyotrophic lateral sclerosis was made based on El Escorial criteria. Pneumocephalus with meningitis usually occurs as a complication of head injury or surgery. It is uncommon after procedures or traumatic injuries to spine. We report an adolescent presenting with features of Pott's spine who developed pneumocephalus and meningitis following spine instrumentation (stabilization of thoracic spine). Early recognition and prompt treatment with parenteral antibiotics resulted in a favorable outcome.